The Compulsive Reader: Steal Alert: Get The Goose Girl! 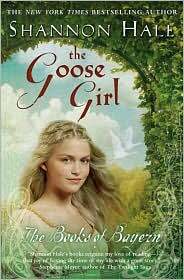 One of my favorite fairy tale retellings is Shannon Hale's The Goose Girl . It was her first book, and the first in the Books of Bayern series, which has plenty of lovely characters, magic, and romance. From now until the end of the month, you can get The Goose Girl in e-book format for only $1.99 ! That's a great deal, and the book is so lovely, I promise you that you won't want it to end! If you prefer print over e-reading, then you can also get the first three books in the series for under $18 here . The books are, in order, The Goose Girl, Enna Burning , River Secrets , and the latest is Forest Born (with a special edition arriving in October!) . I highly recommend them and Hale's other fantasy, Book of a Thousand Days ! That's great price for a wonderful book. It is one where you hate see the last page.